Hello, welcome to my home sweet home page. My working time is mainly shared between teaching computer science and doing research in bioinformatics. Most of my teaching is performed in the Polytech engineering school. I also participate to the bioinformatic courses of the Computer Science Dept in the Science Faculty. 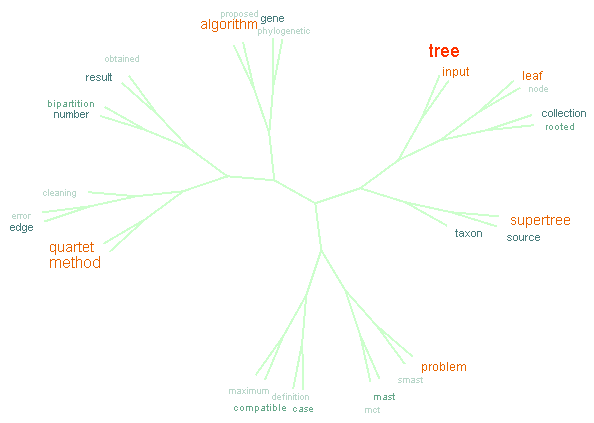 Current research is performed in phyogenomics, from a computer science point of view, dealing with nice combinatorial and statistics problems on trees in the context of databases containing zillions of trees. Tree cloud of the 30 most frequent words of the Habilitation thesis I recently wrote, built with the NJ method applied on Jaccard distances computed on sliding windows of 30 words.